Making India ODF (Open Defecation-free) is a commendable initiative of NDA government as more than half of India’s population lack access to toilet. As per census 2011, 53.1 per cent of India’s population had no access to toilet and 69.3 per cent of rural households and 18.4 per cent of urban households do not have access to latrine. 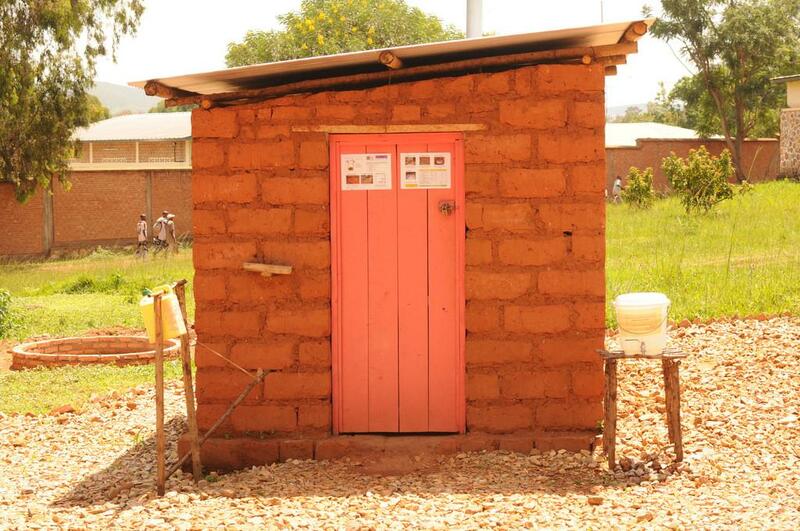 The number of households, without access to latrine, has actually increased by 7 per cent. As per census 2011, out of 130,994 households without access to toilet, 89 per cent are from rural areas. The municipal local bodies so far have not given adequate thought to proper treatment and disposal of sewage. Choosing appropriate design of toilet, propagating technologies relevant in tropical climate for treatment of sewage, creating infrastructure and capacities for the same in local municipal bodies are of paramount importance. India’s architects and town planners must rise to the challenge. 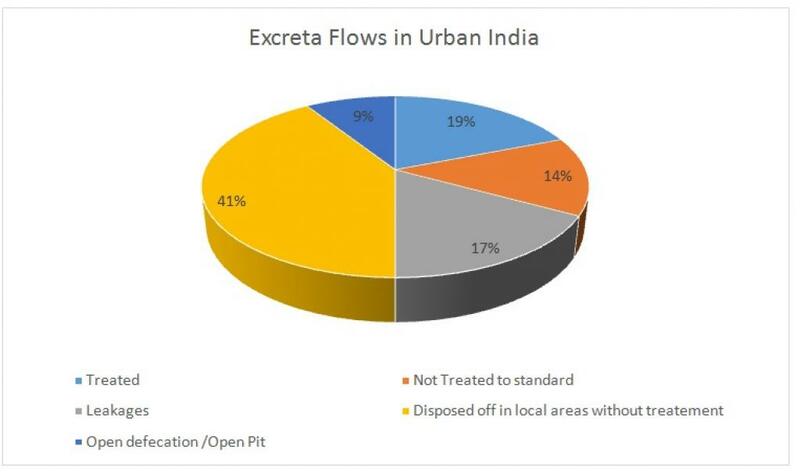 As shown in chart 3, only 19 per cent of India’s excreta are treated to standard. 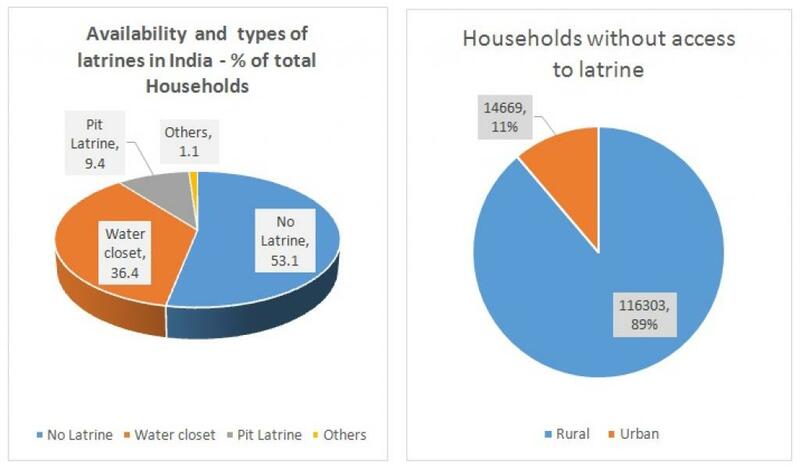 As per census 2011, 9.4 per cent of households use Pit type of toilets. The twin-pit design for toilet in India was pioneered by Bindeswari Pathak, a Gandhian and the founder of Sulabh Foundation. Sulabh’s public toilets are very cheap to assemble by local masons. The toilet uses local materials available. Twin-pit toilets are very easy to maintain and need minimum water. The best part is that Sulabh’s twin-pit toilets, installed on ground surface, have zero effluent discharge system. These toilets have high slope allowing excreta to fall into pit by gravity. It consists of a pan with a steep slope of 25°-28° and a specially designed trap with 20-mm water seal requiring only 1 to 1.5 litres of water for flushing, thus helping conserve water. Scavengers are not needed to clean the pits. There are two pits of varying sizes and capacities depending on the number of users. The capacity of each pit is such that it can be used for 3 years. Both pits are used alternately. When one pit is full, the incoming excreta are diverted into the second pit. In about two years, the sludge gets digested and is almost dry and pathogen-free, thus safe for handling as manure. Digested sludge is odourless and is a good manure and soil-conditioner. The pit design allows action of aerobic microbes, turning excreta into compost within few months. The water used for washing, dries off soon, without contamination of groundwater by pathogens as minimum distance of few metres is maintained between sources of drinking water and pit location. Most of these toilets are connected to septic tanks for storing sewage, as there is no underground sewer connection to sewage treatment plant (STP) in most Indian cities. As per Bureau of Indian Standards (BIS), septic tanks of over 2000-litre capacity must have two chambers, separated by a partition. After primary treatment, leading to sedimentation of solids, soak pit serves as chamber for secondary treatment. The standards for designing of septic tanks are not strictly implemented by most town planners and architects. As a result, in India, most of the septic tanks are built as simply single chamber tanks with cesspools having overflow pipe. Due to overflow of water, drinking water gets contaminated with sewage water. Such septic tanks need to be periodically emptied by municipality’s contractors. According to the Centre for Science and Environment (CSE), every four out of 10 houses in Indian cities are connected to septic tanks, majority of which are designed and constructed in a haphazard way. Most of the private contractors simply empty sewage in any open drain or field. Very few municipal bodies have guidelines for disposing sewage collected from septic tanks. As per CSE, only 19 per cent of urban India’s sewage is treated to standard specifications. Unless we popularise economical technologies to treat effluent water for reuse, India is sure to be under increased water stress. Why are STPs not an appropriate technology for India? 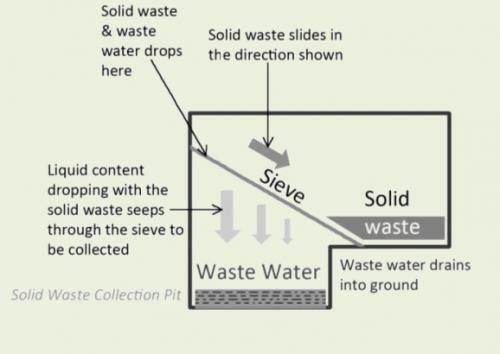 In developed countries, sewage is treated in a STP before discharging, or reused for secondary purposes. Few metro cities such as Navi Mumbai and Delhi have connected waste water to STP. However, if rainwater and wastewater are not separated, then STPs will not be able to handle huge increase in amount of water, including storm water and sewage. Hence, sewage treatment has to be stopped in STPs during monsoon months. As per CSE, 1.2 billion people in India generate 1.75 million tonnes of excreta per day. Only 22 per cent of sewage is treated in India, while 78 per cent is disposed of in open fields, rivers and lakes. As per 2009 data, 38,255 million litres of sewage is generated per day, whereas the municipal bodies had capacity to treat only 11,788 MLD, of which actually treated sewage was only 8,251 MLD. Using water to handle human excreta is fraught with economic and ecological challenges. We need to close the sanitation loop by choosing technologies for sewage treatment that are suitable for tropical country like India. Water, a precious resource, must be reused again and again before it is discharged. As India gets more water-stressed, we cannot afford to ignore the problem of sewage water when India is facing severe water shortages. It’s problem of plenty in water-starved Maharashtra. The Mumbai High Court ordered IPL cricket matches out of Maharashtra to save few gallons of water being used. When rural Maharashtra is reeling under severe water crisis, it is shocking to know that Mumbai disposes of 2000 million litres of untreated sewage per day, in nearby sea. The Mumbai municipality built 2-3-km-long tunnels under World Bank-aided marine outfall project costing over Rs 2000 crore. At the same time, Mumbai municipality is making fresh plans to submerge far-flung forest areas for building another dam and bringing it from 200 km away to quench thirst of Mumbai’s growing population. Imagine how many farmlands nearby would have been nourished with 2000 million litres of water per day, if this water could have been reused and money spent for a more ecologically and economically sound plan. Using water to handle human excreta in water closet toilets of cities seems a convenient but a very expensive solution if costs of sewage treatment are added to it. This is not a nature-friendly solution in tropical developing countries which have lesser availability of water per capita. Several studies have pointed out that conventional public toilets in India are badly maintained, have poor design and ventilation. They also lack water connection as water is not readily available due to its scarcity. No wonder that many public toilets are abandoned. “It is easier to maintain a nuclear reactor in India than a public toilet,” says India’s leading scientist, Jayant Naralikar. Using water to push human excreta was perceived as a convenient way in urban context by architects and civil engineers. At user level, it may have solved many problems by pushing the excreta away in automated way, thereby eliminating manual scavenging. The history of communicable diseases like typhoid, cholera and polio and evolution of antibiotics has roots in unsafe practices of disposing sewage water. Thus, untreated sewage poses greater macro-level problems of polluting water bodies, if proper sewage treatment before disposal is not done. The conventional western technologies of STPs, which involve sedimentation, aeration of water, settlement pond and infrared treatment, are not only capital-intensive but also energy-intensive. The conventional design of STPs needs huge tracts of land within city limits but also need electrical energy to aerate waste water. According to the Planning Commission's report on water sector, the cost of a STP per MLD is between Rs 30 lakh and Rs 1 crore, when land cost and construction costs are not taken into account. The operating cost of treating water is about Rs 20-30 per kilo litre. It is possible that running costs for STPs are usually more than cost of sourcing water for most local bodies. Hence, most local bodies do not have budget to run STPs, even if the capital cost of a plant is not counted). Under Ganga Action Plan I and II, Rs 4000 crore was allocated to build STPs on River Ganga. However, the fund was never been used. This means, India needs to evolve economical solutions that are also nature-friendly. In fact, only nature-friendly solutions can be economical. ECO-SAN (or ecological sanitation) is about keeping human excreta dry. This approach can solve all ecological issues. One litre of water for flushing a toilet turns thousands of litres of good water into bad water, according to K. Munshi, former head of Industrial Design Centre, IIT Bombay. He spearheads design for dry toilet. Waterless (eco-san) toilets save precious water from being wasted to flush excreta. They also save costs associated with sewage treatment. Dry toilet design from IIT Bombay: IIT Bombay’s design cell has designed SS toilet pan that separates urine, human excreta and water at source. As these are separate, their treatment is easier. The urine needs no treatment as it is not a health hazard. Urine evaporates as it is absorbed in ground, enriching soil with urea. The feaces are collected dry. Hence, they need very little further treatment. The water used for washing is collected in digester for some treatment. The SS Pan costs Rs 22,500, in addition to costs for digester and other supports required for installation. Pressure vessels that use air vacuum to push out feaces: Air pressure vessel converts inlet water pressure into air pressure. This air pressure evacuates the commode, similar to what is done on aircraft. As the excreta are dry, it needs little or no treatment before safe disposal on land. Cost of such pressure vessels is Rs 60,000 as these are imported. It is possible to indigenise the technology for use in hotels and multi-storey apartments. Make septic tanks as per BIS standards: Strictly enforce BIS standards for septic tanks where primary treatment for sewage happens, thus obviating the need for STP. The image above shows sea surface temperature anomalies as recorded in late March of 2016 by Earth Nullschool. 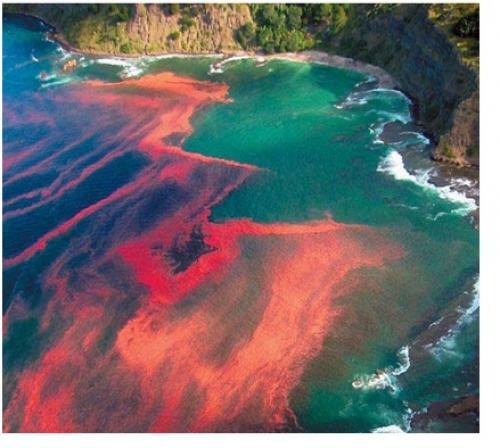 The algae bloom — called a red tide — killed massive amounts of clams, fish and even marine mammals. Beaches across Chile were littered with dead sea creatures and Chilean officials are now saying that the current red tide is the worst ever to occur off Chile. The history of using water closet in sanitation is not more than 300 years old. The water closet and technologies for STPs have originated in Western countries, with abundant availability of per capita water. Much before water closet was invented by western civilisation, it was well known in India and China that human excreta makes excellent natural fertiliser Dried human excreta enriches farmland by returning nitrogen. Abundant radiation of sun sterilises the pathogens, as long as direct contact with potable water is avoided. If excreta can be handled using land-based technologies, then human health, environmental and ecological problems can be solved in an economical way. Land can be used as biological filter for growing non-food crops. Handling and disposal of massive amount of water in centralised sewage treatment plant is most challenging. Using land mass to filter sewage is ecologically and economically better than using STPs. Sewage is actually a resource if treated on land and reused for agricultural purpose. Sewage was safely used for growing grass pastures in most Indian cities. Such farms had abundant grass even during summer months, as per Chitra K. Vishwanath of Biome Environmental Solutions. The Indus Valley Civilisation in India showed evidence of sanitation system. Every house in Lothal, the Indus city, had their own private toilet connected to a covered sewer network constructed of brickwork and gypsum-based mortar. The sewer emptied either into the surrounding water bodies or alternatively into cesspits, which filtered water so that the pit could be regularly emptied and cleaned. The urban areas of the Indus Valley civilisation provided public and private baths, where sewage was disposed through underground drains built with precisely laid bricks and a sophisticated water management system with numerous reservoirs for rain water harvesting was established. Today’s architects and town planners need to reinvent the ancient wisdom, evolving nature-friendly land based sewage treatment solutions that are economical because they are not against the ancient systems under five Pancha Mahabhutas (Five Great Elements): fire, water, earth, air and space. As per ancient Indian texts, our world is divided into five mega system of elements called as “Panchamahabhutas” . The five mega systems are Land (Prithwi), Water (Aap), Air (Vayu) – Fire/Sun (Tej) and Space (Aakash) that govern mega systems of living organisms in their confines. Using nature’s omnipresent forces, one can live in harmony with nature. The hierarchy of living beings on our planet, land, water and air has evolved naturally over millions of years in a harmonious way. Within each mega system, nothing is wasted; everything is transformed into a resource by participation of a species that seems to have evolved only for this purpose. Thus, each species in mega system has a role to thrive on exhalation, excretion or body remains and waste from another organism. One organism’s waste becomes food to another. Such a symbiotic living is the essence of life on our planet. To some extent, emissions, excretions, or outflows from land to other mega systems like water and air were also turned into resource. However, if limited amount of excretions from land animals were pushed into another mega system, for example water bodies, it will provide extra nourishment to aquatic plants, algae and phytoplankton. After a certain level of biochemical oxygen demand exceeds, it will lead to pollution and killing of other aquatic animals. In natural world, everything is a resource. Sewage, too, is a resource that would normally nourish land. As is well known, microbe action converts excreta of all animals on land, thereby returning precious nitrogen to soil. Plants, in turn, take up nitrogen in soil, and carbon in air, in presence of sunlight, to convert into food that nourishes human being and the herbivorous animals to complete the Nitrogen cycle. However, human beings have intervened in the nitrogen cycle of land, resulting in pollution of water bodies by extra nitrogen. The rhythm of such Nitrogen cycle has been disturbed ever since human beings started using water to push human excreta away into water bodies. What would have nourished land in a positive way has started to pollute water bodies (due to excess nitrogen). When in contact with water, pathogens multiply in human excreta, causing multitude of communicable diseases like typhoid, cholera, polio and hepatitis A. As human beings started using chemical fertilizers to increase crop yield, the run off from unabsorbed chemical fertilizers added to nitrogen load in water bodies, leading to increasing eutrophication. Water bodies like lakes, rivers and oceans have extra nutrient that is leading to the growth of weeds and algae. Extra nitrogen is now causing massive algae blooms in lakes all over world. We, in India, observe rampant growth of weeds like water hyacinth in all cities, choking other aquatic species like fish by taking away dissolved oxygen from water. Extra nitrogen and carbon from sewage is making our oceans acidic, leading to death of coral reefs. Saturated oceans have reduced capacity to absorb extra carbon in air, leading to higher carbon dioxide in air, causing catastrophic climate change due to warming. India can show the way to the developing world of using nature-friendly technology by re-engineering ancient wisdom. The entire group of developing countries is urbanising with similar problems. Their local bodies cannot afford expensive western technologies. Moreover, STPs do not work where monsoon storm water gets mixed with sewage water in STPs. The radiation from sun and microbes in land that have evolved over millions of years offers cheaper alternatives than conventional STPs. It is time India led the way towards evolving ecological and economical solutions using nature-friendly technologies. For solving solid waste problems of cities, it is necessary to separate solid waste, reduce and recycle or reuse components of solid waste for local treatment. For solving sewage problems, similar strategy needs to be adopted. Separation at source: The various components of waste water need to be kept separate at source such as grey water (from bathrooms), storm water (from rainfall), black water (from latrine) and urine flow (from latrine). Each needs different approach for treatment. Reduce: By using waterless ecosan, (like vacuum and gravity instead of water flush), one can reduce water being used for pushing excreta. Reuse: The grey water can be used for gardening and growing canna plants like banana, without much treatment. Thus, both for solid waste as well as waste water, local treatment (on site) is a much better option than centralised processing. Unlike human world, nature works on principles of negative entropy, creating wealth and abundance from anything and everything that appears as waste in human perspective. In nature’s complex and advanced hierarchy, nothing is useless as long it is nature’s own creation. We can evolve cost-effective and ecological solutions in partnership with nature. Lobbies with vested interests may try to divert public funds for solutions like STPs that benefit neither ecology nor economy. Nature’s mechanisms can quickly nurse back the planet if its healing forces are allowed to play. India can take the lead in rekindling nature’s mechanism honed over millions of years of evolution to heal our planet earth. This article is brilliant and prophetic. Like Back to the Future. Even before improved and better designs for dry pit latrines came about (and are still to be adopted on a scale that will make a difference), the humble dry pit latrine, made some distance from dwellings, usually in fields, have been not only affordable but quite clean, sustainable and extensively used in the mountains at least. Water guzzling flush toilets as is being promoted under Total Sanitation are bound to boomerang badly one day. WE SIMPLY DO NOT HAVE THE WATER! Kudos to Mr PN Pandit for bringing this out so compellingly. As he mentions it is not just the mixed up idea of 'modern' but perhaps BIG lobbies of cement and sanitary ware that also fund elections, who want it otherwise. Great insights. 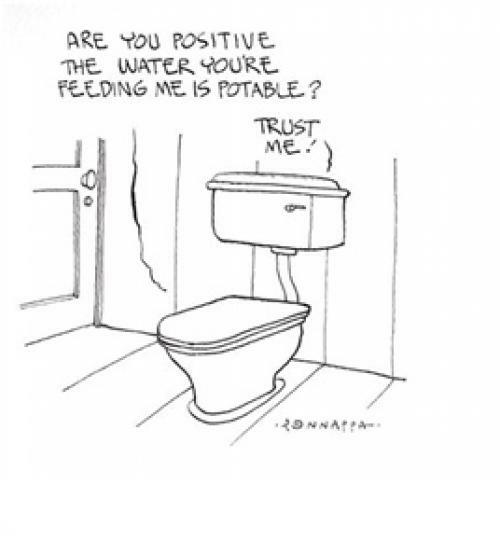 Most of us urban people think that water closet is the only option available. The article is very relevant in the Indian context, facing water scarcity and water contamination issues. If we fail to understand the need to rethink on appropriate technical options, we are heading towards Disaster in Waiting, that too Man Made! In Bihar, northern area is flood prone and population density is high. Even leach pit toilets may pollute the ground water, as it is very difficult to maintain the minimum distance between water source and leach pit .